I can't remember what post Zack Rock first commented on on this blog, but that's how I met him. 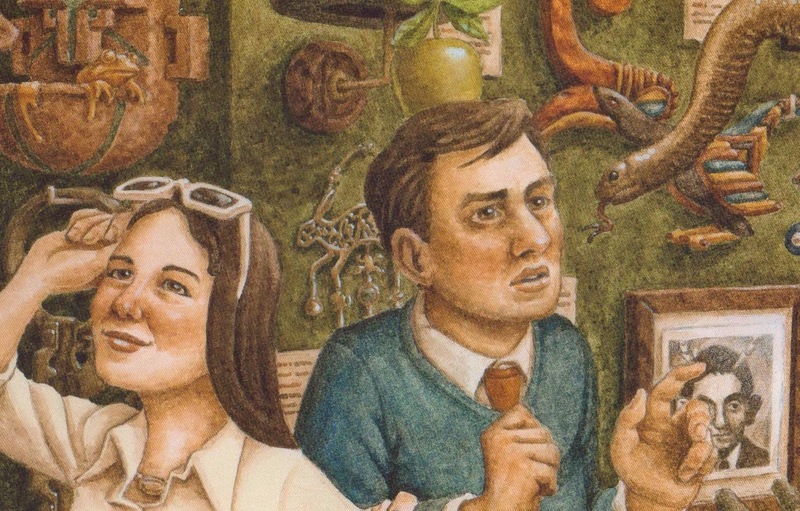 One click on his website and one look at his illustrations and it was instant love. Perhaps it was the fact that he drew amazing birds. (You long time readers know that is one of my son's favorite things!) 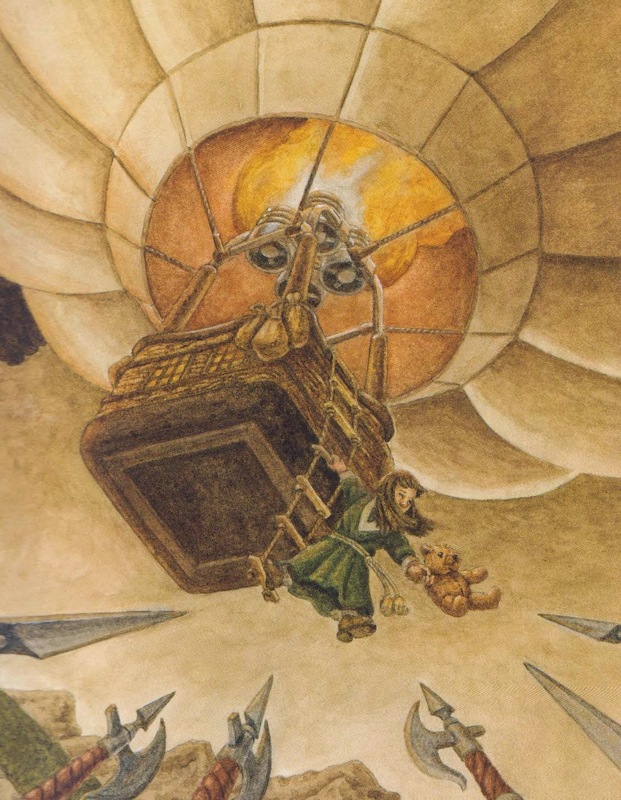 Perhaps it was the sheer amount of magical realism and fabulous detail in his work. 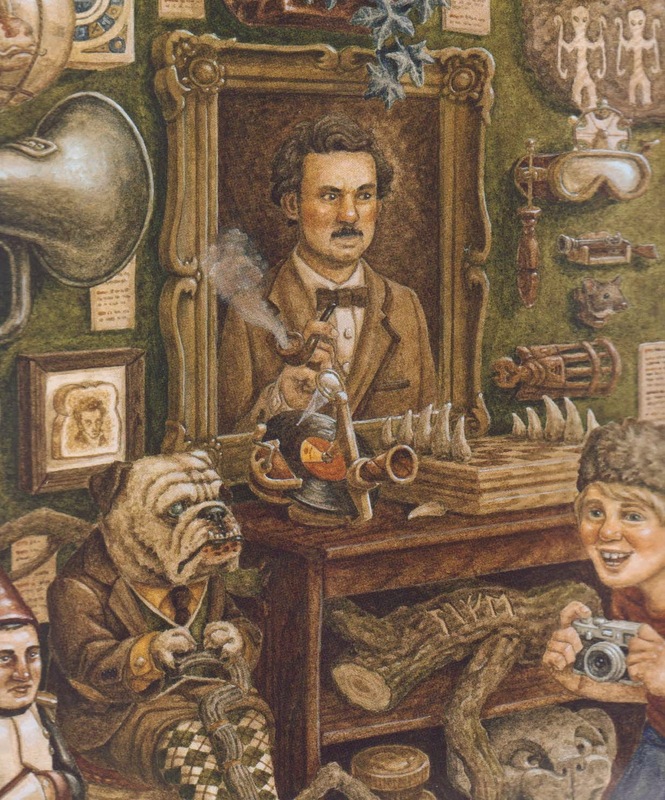 Maybe it was the intellectual whimsy and humor he displays in each and every one of his drawings. Who knows... but whatever it was, it kept me coming back again and again to peruse his watercolors and follow the funny cat stories on his blog. I got him to paint a picture of my son astride a peregrine falcon, and eventually asked him to paint the banner you see up top. Zack's a huge talent, a perfect gentleman, and a true artist. 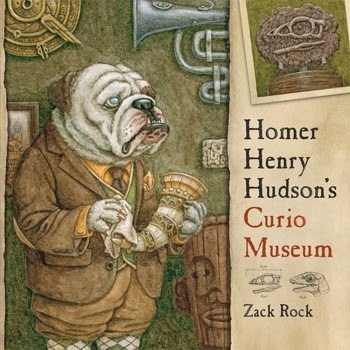 I was lucky enough recently to snag a preview copy of his very first book (out in August), Homer Henry Hudson's Curio Museum...a book Kirkus calls "masterfully illustrated... infused with touches of humble elegance". I happily second that emotion. "Everything has a story. Take the Homer Henry Hudson Curio Museum. Looks like an old schoolhouse. And it did, once, serve the children of Bolshoi, four towns over. The Columbus Day Twisters of '67 sprang the schoolhouse skyward, where it leaped and pirouetted like a ballerina before landing here, upright, its dignified demeanor intact. The museum houses -- to quote one recklessly alliterative reviewer -- 'a colossal collection of curios, discovered, described, and displayed by that eccentric explorer extraordinaire: Homer Henry Hudson'." Part Indiana Jones... part The Tyger Voyage, the story follows an exploring (though semi-retired) bulldog and his collection of all things curious, gathered from all the most exotic locations in the most remote and mysterious corners of the world. "Every thing has a story: the dullest clam may hold the brightest pearl." Highlighting some of his favorites from the collection... a radial tide diviner acquired from the Ionian Sea... a Temple Montepaz choir finch from the Andes Mountain Range... each with a personal note highlighting details from the acquisition. "The Manneken Mort of King Ingmar: Figure composed of hundreds of thin fabric threads. When a Nottlander passes away, their friends and family gather to tell stories about them. 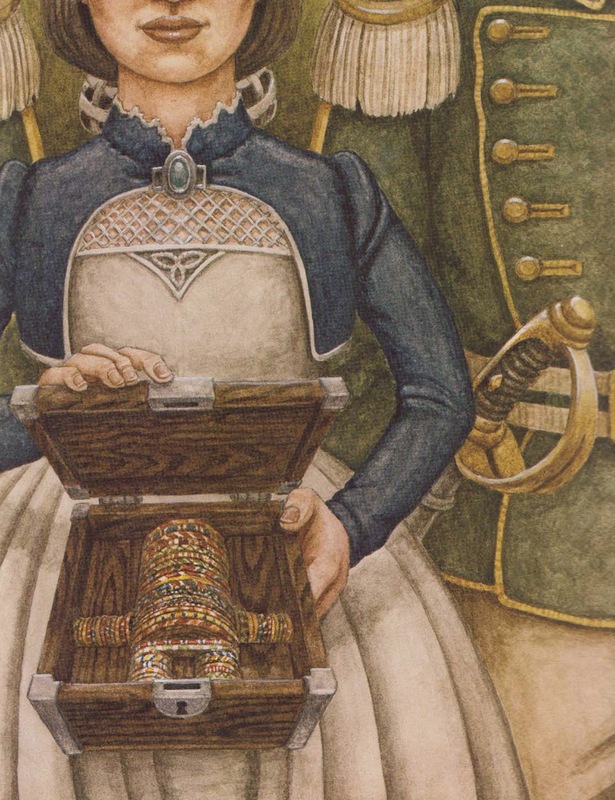 For each story, a bright new band is woven into the figure." 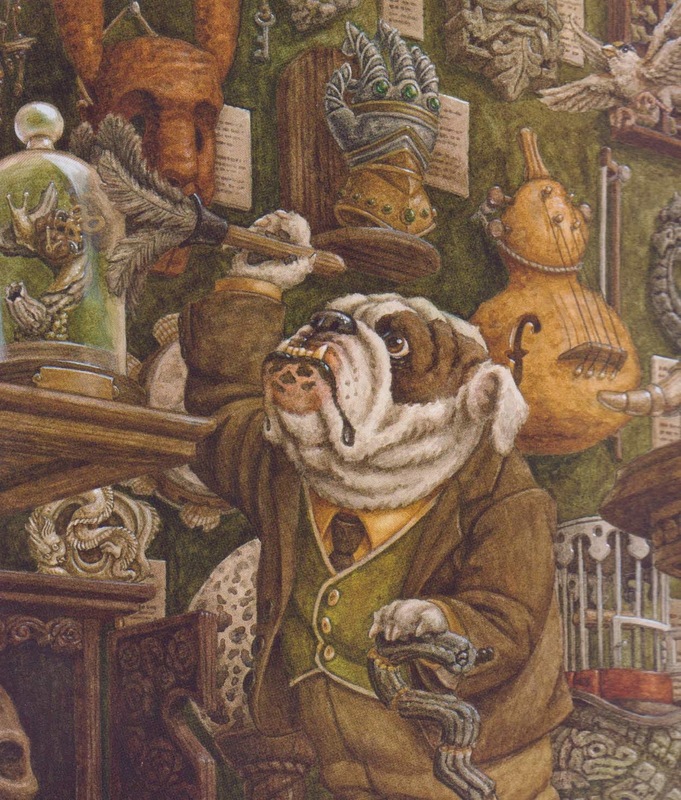 It is through these remembrances that the bulldog convinces himself that it is time again to hit the road to find out.... that he still has more stories in him. Goodness. Each picture has a ton of hidden treasures. 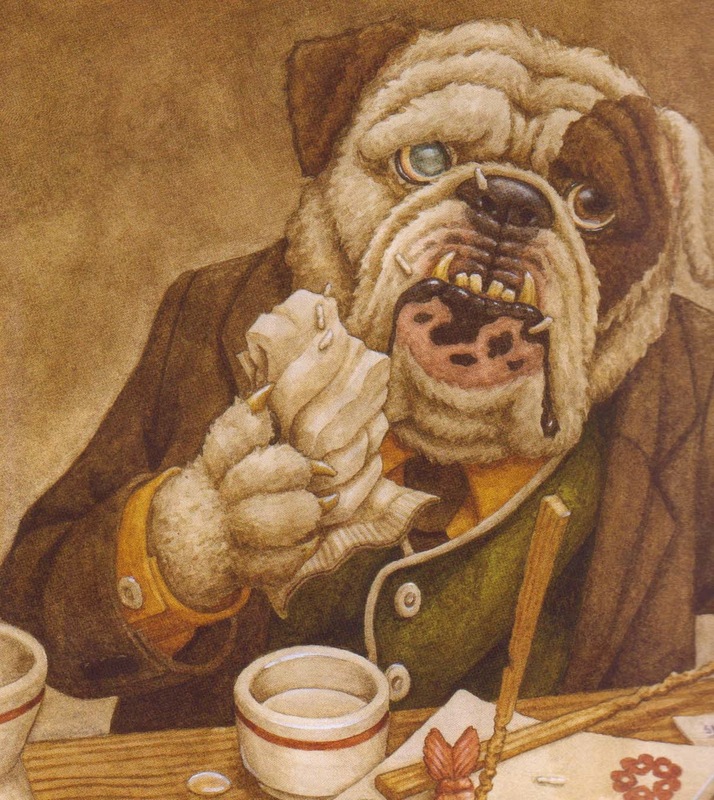 And each glimpse of the bulldog's expressive eyes (one blue and one brown) has you wishing you could hop on that steam cruiser and set sail for adventure with this daredevil doggie. This is THE book I will be giving for the holidays. Not to be missed! Stay tuned in the coming days for a Q&A with Zack and a giveaway! I am giving Henry Homer the ultimate endorsement of........... 100,000,000,000,000,000 thumbs, five pinkies, two index fingers, and a pointer finger way way UP! Congrats Zack! I sincerely can't wait to see what's next. Your momma must be so proud! Read along on Facebook, tumblr, Twitter, Etsy and Graphic Novels My Kid Loves. Lovely review, lovely book. And the banner Zack created for you is marvelous! Pretty special stuff. Wonderful! Thanks for giving us a preview of this book; it looks fantastic. Congratulations to Zack. These illustrations have an authenticity that is timeless and quite appropriate to be seen on your site. Thanks for sharing these inspired titles! Image rights reserved to artists. To reblog, give credit & site source. Banner Art © Zack Rock. Powered by Blogger.